French banker; born at St. Esprit April 11, 1797; died at Bayonne May 20, 1883. He was a descendant of a Portuguese family, and a nephew of Abraham Furtado, president of Napoleon's Assembly of Jewish Notables. From 1831 to 1871, with but little interruption, he was a member of the municipal council of Bayonne (1831-51 and 1855-71), serving twice as mayor (1851 and 1869). He was a member of the chamber of commerce (1859-78), and its vice-president in 1878; and was administrator of the Bayonne branch of the Bank of France from 1861 up to the time of his death. In 1851 he became chevalier of the Legion of Honor; in 1879 officier de l'Académie, and officier de l'Instruction Publique. He took an active share in Jewish matters, and was president of the Jewish consistory of Bayonne from 1846 to the end of his life. 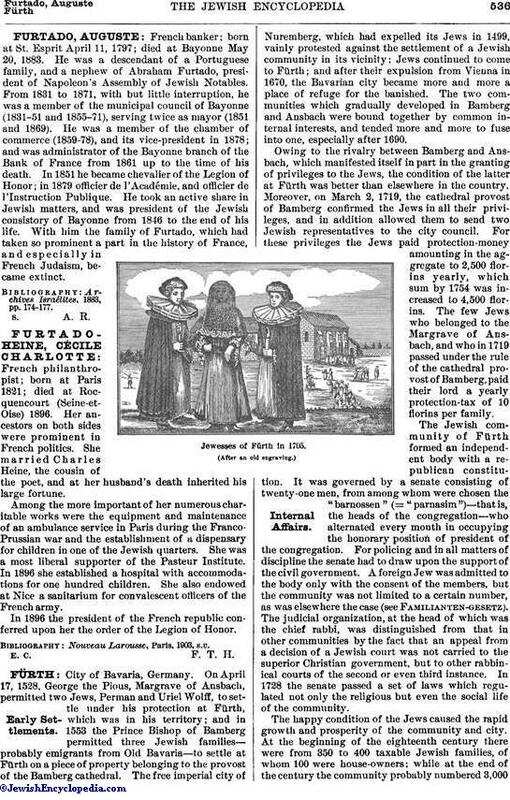 With him the family of Furtado, which had taken so prominent a part in the history of France, and especially in French Judaism, became extinct. Archives Israélites, 1883, pp. 174-177.